Located in the bustling neighbourhood of Gachibowli is the quaint boutique hotel, Ellaa. If you’re looking for a luxurious stay(cation) that doesn’t weigh heavy on your pocket, get here. We’ll give it to you straight: we were in search of a place that’s a stone throw from the urban jungle but in a world of its own. We found a perfect escape with Ellaa as it has a large pool, charming gardens in the courtyard, restaurants whipping different cuisines, and a spa. Just when we thought our weekend was sorted, we found better respite in the room. Offering three types of rooms — Ellaa suites, executives suites, and superior rooms, each of these is designed with a modern (and urban) home touch. 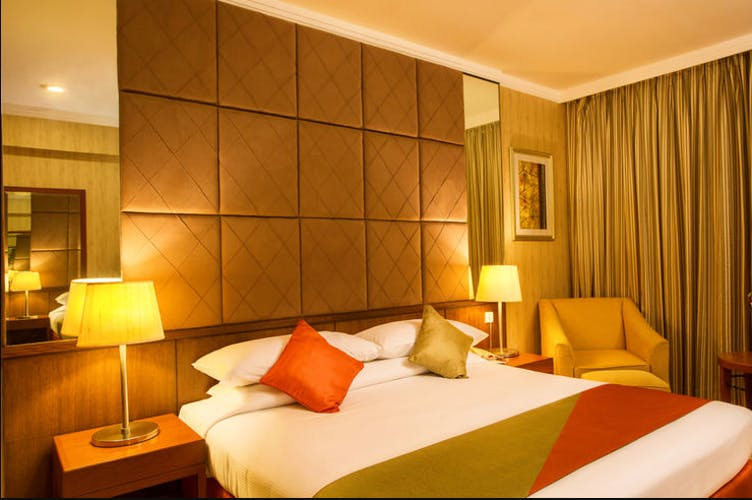 The executive's suites and the superior rooms are done impeccably with wooden furnishing and the decor is in earthy colours and matches the furnishing. We opted for an Ellaa Suite which has a living room as well as a section for a dining room. Both the bedroom and living room have TVs and study tables along with ample storage space. While the executive suites aren’t as spacious as the Ellaa Suite, they have the same facilities. Plus, all the rooms have a microwave oven, refrigerator, bathtub etc. Candidly speaking, this property is a great option for the ones who want to unwind within the city without stepping out. Or if you have business colleagues needed a place for long-term stay. Fitness freak? Then you cannot miss out on the swimming pool or the fully-equipped gym. Plus, you can relax at Nirva Spa with a massage or a hair spa. And the best part? The prices aren’t too steep. While booking the rooms, you can opt for a breakfast buffet which is priced at INR 500 extra (depending on the site you book) per room and you can enjoy several varieties of bread, detox drinks, North Indian & South Indian delicacies along with Continental breakfast. You will also find yourself at the live station for waffles, eggs, and dosas.